In a recent interview, someone asked me how I've met some of my closest friends, and it occurred to me that although the path to friendship is oftentimes as simple as "I worked with the guy" or "She was a friend of my wife," sometimes the path is far more unexpected, circuitous, and odd. Shep is my seat mate at most Patriots games. He is the first reader of almost anything that I write. He is the person who I want most at the poker table. If forced to choose one person to accompany me on a drive across the country, I would choose Shep. I met Shep at a bridal show about 20 years ago. He was hunting for a DJ, and I was hunting for clients. Things worked out, and my partner and I became the DJs at his wedding. Though I knew we had a lot in common and would likely get along well if we were friends, the wedding ended and we went our separate ways. This was before social media had any chance to keep us connected beyond real life encounters. More than a year later, Shep and his then wife, Kelly, attended another wedding where I was working again as the DJ. We reconnected at the end of the night, and in the process of catching up, I invited Shep and his wife over to my home to hang out and watch television. The actual show escapes me. Or possibly the Thursday night lineup of Seinfeld and Friends? I'm not sure. Either way, Shep and his wife accepted my invitation, and soon they were making the weekly trek from Norwich to Newington - almost an hour each way - to spend an evening with me watching TV and hanging out. Around this same time, the librarian in my school, who was also a Patriots season ticket holder, began selling me her tickets to games. Needing someone to join me at the games, I asked Shep, and so began our excursions to Foxboro to watch the team we both loved. Shep and his wife ultimately divorced. He and I remained friends, continuing to attend Patriots games, adding card games and eventually my writing to the mix. 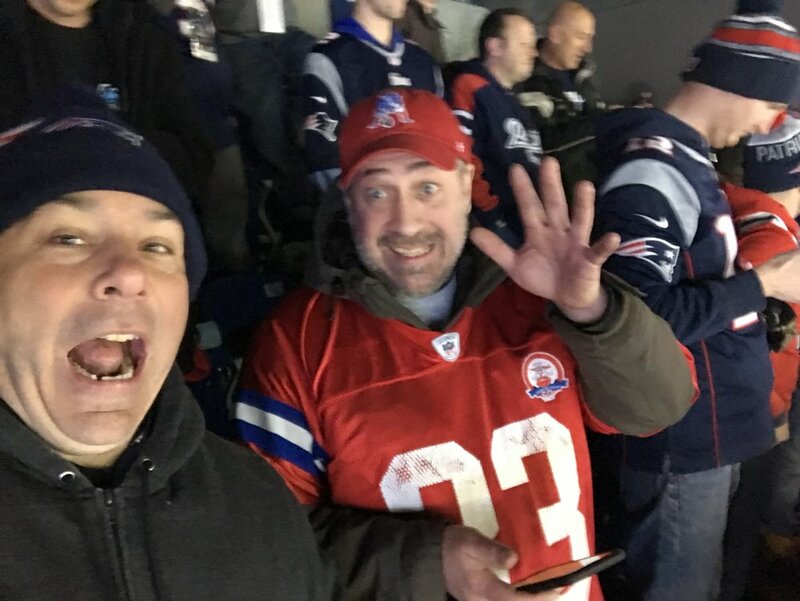 About 15 years ago, Shep's cousin-in-law, Tony, was able buy two new Patriots season tickets, adding them to the season tickets he already partially owned with friends. He offered to sell them to Shep and me, and we agreed, becoming seat mates, tailgating professionals, and denizens of Gillette Stadium during the single greatest period of football in NFL history. Shep and I have attended seven AFC championship games together and untold numbers of playoff games. We are in the process of writing a memoir of our 20+ years spent in Gillette Stadium. Odd to think that had Shep and his then wife not stopped by the DJ booth at the end of the wedding, and had I not invited Shep to hang out and watch TV with me, and had he and his then wife not agreed to make the almost hour-long drive to me home, much of the last twenty years would've been very different for me.